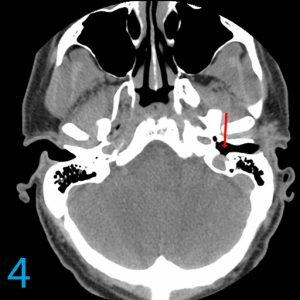 Patient is a 37-year-old with left-sided tinnitus described as buzzing in the left ear. 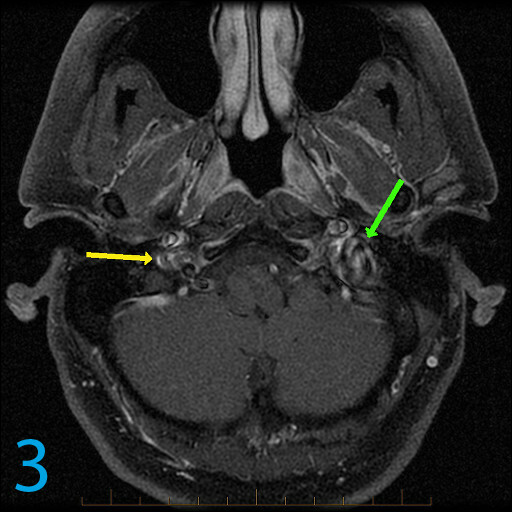 MRI was performed to exclude the possibility of a mass in the internal auditory canal. What are your findings? Try to solve the case with the first three images from the MRI before looking at CT images four and five. 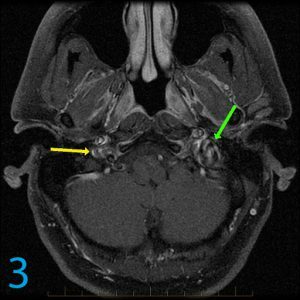 The diagnosis (jugular bulb dehiscence) was suspected in this case due to the presence of a large ectatic left jugular bulb (images 1-3, green arrows) correlating with the side of described symptoms. The right jugular bulb is indicated with the yellow arrows on images 1 and 3. 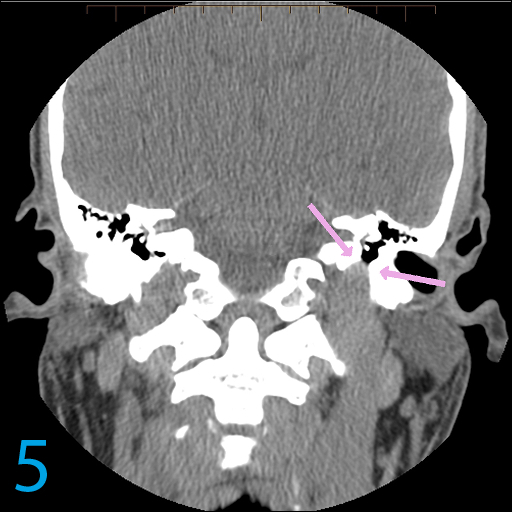 Followup CT skull base did demonstrate abnormality of the left jugular bulb with deficiency of the left sigmoid plate (image 4, red arrow) with communication between the jugular bulb and the middle ear (image 5, pink arrows). Jugular bulb dehiscence can be a cause of tinnitus and may be suspected when a patulous jugular bulb is present on the side of described clinical interest. 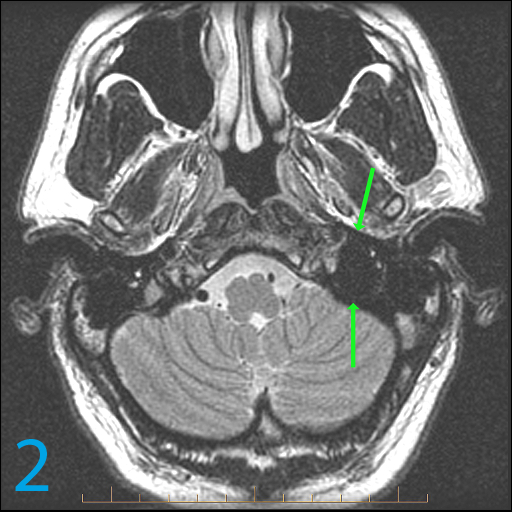 Confirmation with skull base CT, as in this instance, can be helpful. 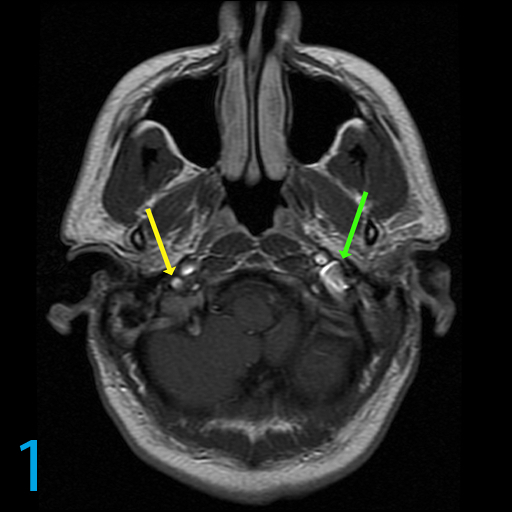 What is causing sudden right-side blindness in this 10-year-old girl? What are the best MRI next steps for this stroke patient? ADEM or MS? 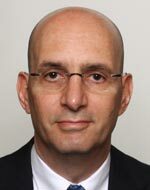 How to differentiate between two favored diagnoses.